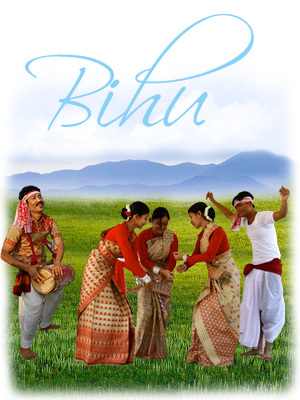 You all are welcome to the fascinating and joyful world of the absorbing East Indian festival, Bihu. The harvest festival is celebrated thrice a year. Impressive and very own dance forms and magical tunes of folk music create a soothing and charming environment for the natives and tourists. It’s an occasion when everyone congregates and dances with the tunes of Bihugeet. There are no religion barriers. TheHolidaySpot takes the opportunity to celebrate the juvenile carnival with you all. Visit the site and get to know the history, significance of Bihu, types of Bihu, essence of Bihu performance, craft ideas and recipes. Try to answer quiz questions and know how much you are aware of the interesting festival. Watch and click to download colorful wallpapers. Know the history behind Bihu festival. Send this wonderful ecards to your near and dear ones. Adorn your desktop with these wonderfull HD Bihu wallpapers. Try out some easy to do Bihu crafts. Some mouth-watering recipes specially chosen to mark the occassion. Get to know the true essence of the Bihu performances. Learn about different types of Bihu and their features. Tickle your Brain cells with wonderfully made Bihu quiz. Wish your friends in FaceBook with these beautiful cards.